Last week, I felt very nostalgic and melancholy for a yearning for the return of Christmas, after taking most of the decor down my sitting room feels bare with no black sparkly tinsel tree. For me, this is an odd sensation, I explain the rationale of my feeling. Is age? The first year of the festive period in my new home? Or perhaps, waking up at 6 am on a cold morning and seeing the thick fluffy virgin snow lying everywhere resonating the sensations of Christmas. So this feeling has brought back a memory I wanted to share it's not grand, fabulous or amazing. Just the simplicity of revisiting my favourite place accompanied by the other half. Over the festive period, we over indulge on the sofa, watching festive films and pursuing our own interest me crafting, and him, gaming. We rarely venture from the comfort of our home. On Thursday, we ventured up to my favourite Northumbrian Market Town, Hexham. I love going up at least twice a year to visit not to mention a good excuse for a charity expedition.This place is a little-hidden gem of history, cultural and not to mention a few decent ale bars. It meant we avoided Newcastle during the Christmas sale rush, as we got the Hexham bus from the West Raod. This road was where the original Hadrian's wall ran, so technically we live on the Pick side. We got the slower bus which took an extra twenty minutes, yet, it was worth it as I enjoyed seeing the winter Northumbrian scenery. Normally, I would head to the first the charity shops, since the boyfriend was me we headed to a cafe for food, as both our stomach were grumbling. Afterwards, we found a pub with a decent ale selection. After food, I ventured to the charity shop while leaving the boyfriend in a warm pub with a decent pint, as he hates any form of shopping. 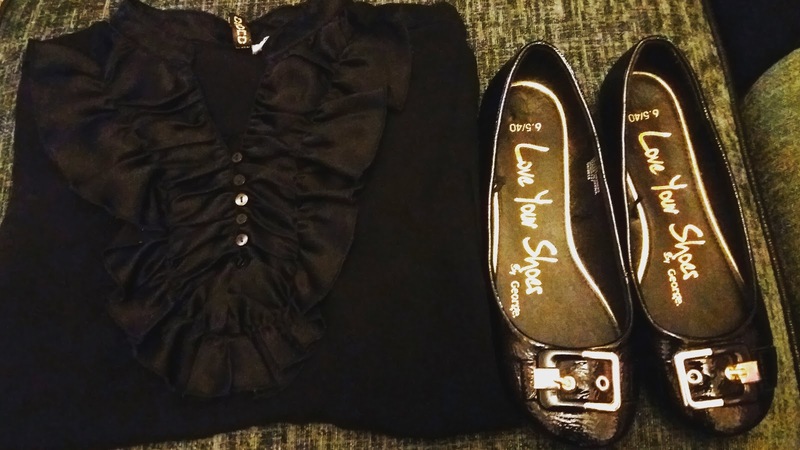 I spent £3 I found a gorgeous ruffled blouse and pair shoes, I was so happy. There were slim pickings in comparison to other times I've visited but I guess that normal. We headed off to look, Hexham Abbey, I don't know how many times I visited this place it never feels like a proper trip unless I pay my respects and go for a wander. Despite my frequent visits, the Abbey feels like a living entity that continual changes and evolve particularly with the changing of the seasons. The atmosphere and essence always reflect the different season and times I visit. In all my years of visiting, I think Christmas has to be my favourite period as it had such a wonderful ethereal feel without the imposing or authoritative feel. It far more relaxed and welcoming place. The low twilight light peeking through the stained glass, which illuminates up the interior with the rainbow of colours. I love the various light streaming through highlighting and creating shadows with the arches adding a sense of depth. The church adopted a simple decor utilising natural decor of garlands and floral display of red and green with an interesting contrast of tropical flowers and evergreen. A spruce tree that felt huge and overpowering when I stood next to it. When I went up to the stairs it to In the overall perspective, the tree was rather dwarfed by the towering arches. I couldn't revisit this shot as it resembled Escher's sketches. with the composition of the structural arches and swirling metal and each of their outline meets creating an interesting but baffling image. Every time, I visited the Abbey there always seem to be some new or something I've overlooked on my visits this time I couldn't help being drawn to stone figures carved on the Leschman Chanty. The images to be a range of humorous, satirical, and grumpy figures each depicting a scene. This is a bagpiper. It reminds of my partner as it looked although he was smoking a pipe with a cup of beer. I found the beautiful mural depicting the Annunciation of Mary receiving news that she would be with child from the Arch Angel, Gabriel. It's hidden away on the central passage located on the side. I love the use of the vibrant red and gold-tone it was painted in the fifteen century, considering the time year it seem perfect on. After spending time wandering around the chapel, we headed to another pub for drinks and head back as soon as possible. Thanks I do love living in this oart of the world it probably why I never bothered moving. I love looking in old Abbey churches or catherdrals. It's such a pretty place to visit. Normally, I'm glad to see the back of Christmas but I Was slight sad, weird. Hexham Abbey is beautiful and cool looking! Love those stone figures! The blouse and shoes you got are very pretty! Hugs! Hugs. I couldn't resist that blouse and considering the price. I love Hexham abbey it's such a pretty place to visit. I know, it 's hard to believe the present Abbey over 900 years old. The actual location vaults go back the 7th century. OMG, it's such a lovely town! A New Fuse + New Light Bulb = Happiness.